Are you burning the candle at both ends? You need to read this. For real ... you need to read this. Something was off and I knew it. We were visiting family in Indiana, so I set up an appointment with my mentor Pastor Dave Engbrecht from Nappanee Missionary Church. As I sat in Pastors office several months ago, I started to talk about my life. How I was pushing so hard but not seeming to move forward. At least not at the pace that I wanted. I expressed the frustration of wanting to do more. I wanted to reach more people. I felt called to disciple more believers and train more leaders. However, I just couldn't seem to get the traction I was looking for or the contentment in the journey. My marriage was great, my family was awesome, and I loved the people in my church, but I guess I just felt like I was burning the candle at both ends. At the end of our conversation he started talking to me about a Pastor from Aida, Michigan named Jeff Manion and his book Dream Big, Think Small. He walked me through the premises of the book, and I knew it was one that I needed to read and apply. So I took the book home, and started going through each chapter, journalling all along the way. The principles Jeff wrote about and the questions that he asked in the book were so challenging, that I could not help but change. Now I can't say that since ready the book, my church has grown by 40% but what I can say is that I am walking out daily routines that bring health to my body, my mind, and my life. 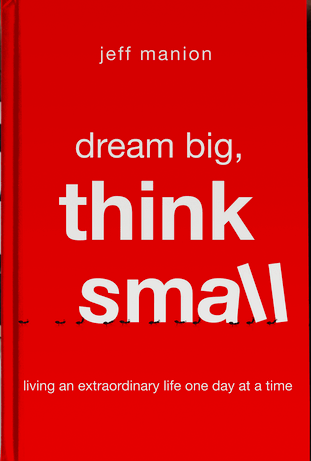 Dream Big, Think Small is an absolute must read for anyone who wants to accomplish extraordinary things and not lose themselves along the way. Please note, neither Jeff or Dave have asked me to promote this book. I just feel so strongly about it that I wanted to share it with you. Below is the link to Jeffs website. Check it out. Pick up the book. Read it. Journal your thoughts. And start to change.